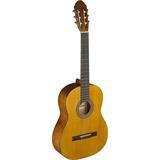 This beautiful classical guitar is made of high quality limewood. This kind of wood makes the sound really sparkling and full. This is the full-size model which is great for adults.